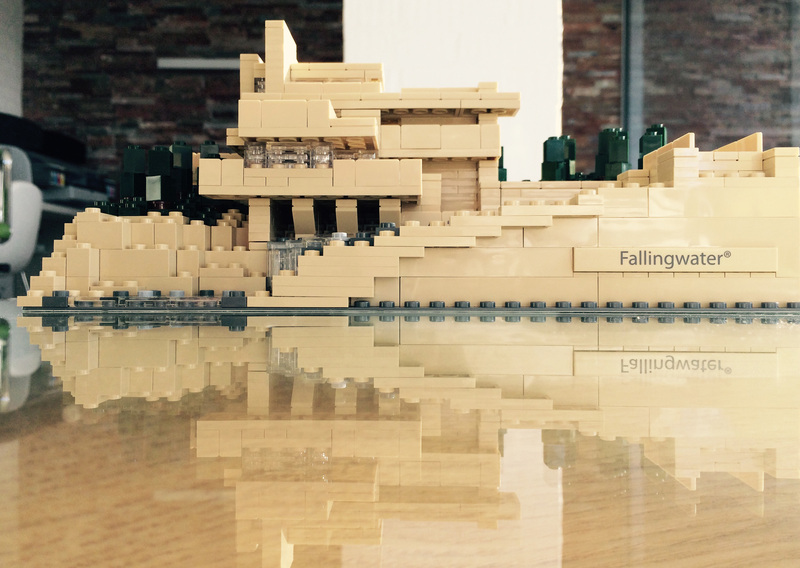 This is a model of Fallingwater; the Kaufmann Residence in rural Pennsylvania designed by Frank Lloyd Wright. Built in the mid-late 1930s, the architecture is striking, not least because it employs a cantilevered construction to extend over the plot’s 30-foot waterfall of the Bear Run tributary of the Youghiogheny River. Wright designed with the principle of harmony with nature at the forefront, a philosophy he called ‘organic architecture’ – nowhere is this more evident than the Kaufmann Residence. The Kaufmann family fell in love with Bear Run when they hosted summer camps for the employees of their department store and they used a cabin up there as a rural retreat. When it deteriorated, they contacted Wright. Fallingwater captured 1930s America’s imagination and in 2007 was named ‘best all-time work of American architecture’ by the American Institute of Architects. And our creative director was pretty captivated by the Lego project, which uses clear tiles to represent the waterfall and a cunning slot and lock mechanism to bring all the elements of its construction together. Aside | This entry was posted in Architecture and tagged Architecture, Christmas, design, Frank Lloyd Wright, Lego, Mid Century. Bookmark the permalink.